Situated between Norway and Iceland in the pristine waters of the North Atlantic, our Faroe Islands Salmon is of the finest and most desirable quality. It's sustainably raised, meaty, full flavored and nutrient-rich – AKA, all the ingredients to make for a healthy yet indulgent dish! 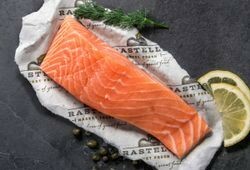 But if you're wondering what the best part is, it's this: Choose between our Lemon Garlic or Tuscan Herb Butters to pair with your premium Salmon for a totally customized dining experience. The choice is yours! Pairs well with any of our gourmet sides! 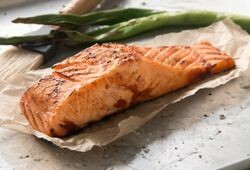 Ordered this salmon thru QVC (14 pc) and was wondering what it would taste like. Well, it was the best tasting salmon I have ever had! Bar none! It was so fresh and flavorful and just melted in my mouth. I ordered the Tuscan Herb butter and it put the flavor over the top. (I'm glad I put ordered it on auto-ship!) Thank you for the great quality of this salmon. It is appreciated!